Managing roof runoff on homes without gutters. Purpose: Dripline trenches collect and infiltrate stormwater, and control erosive runoff from the rooftop. The trenches collect roof runoff and store it until it soaks into the soil. These systems also minimize wear on your house by reducing back splash. Installation: Dig a trench that is 18” wide and at least 8” deep along the drip line. 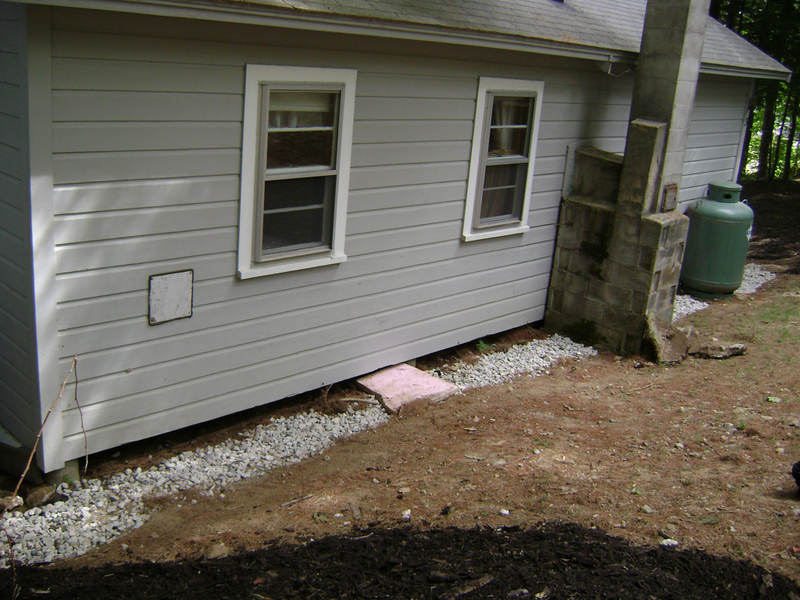 Slope the bottom away from the house so that water will drain away from the foundation. 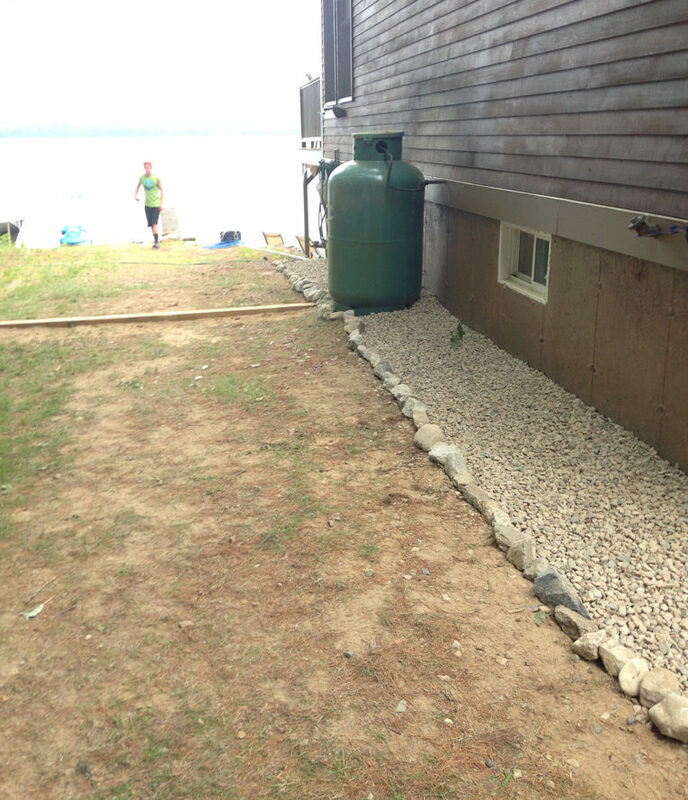 Make sure to dispose of the soil in a flat area where it cannot be washed into the lake. 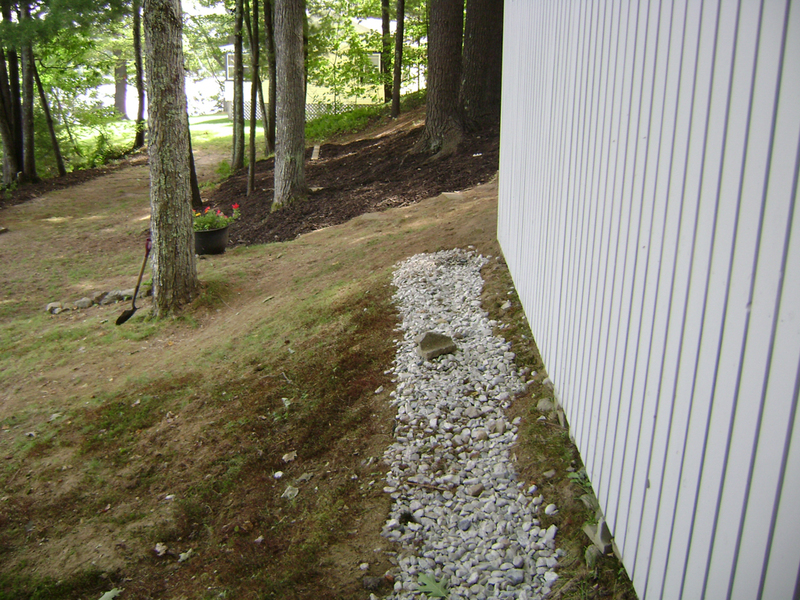 Fill the trench with 1⁄2” -11⁄2” crushed stone. 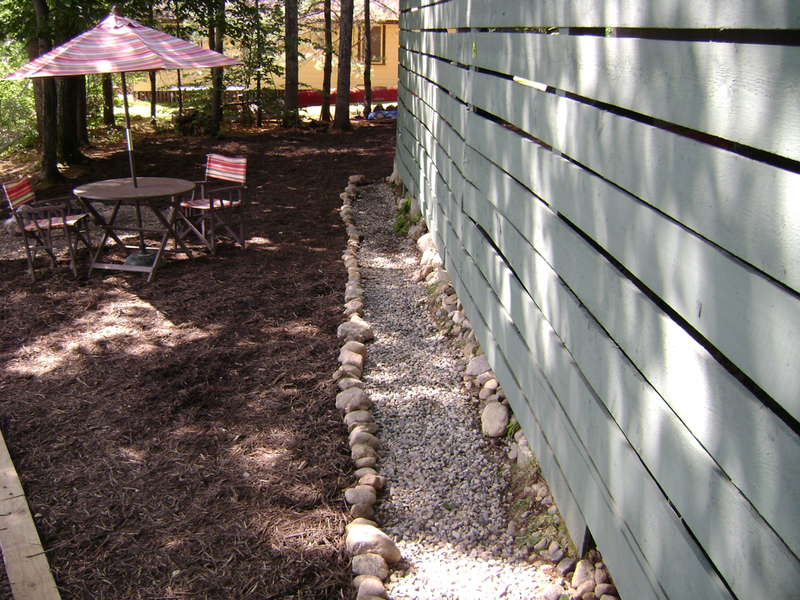 The front and sides of the trench may be edged with stone or with pressure-treated lumber to hold the stones in place. 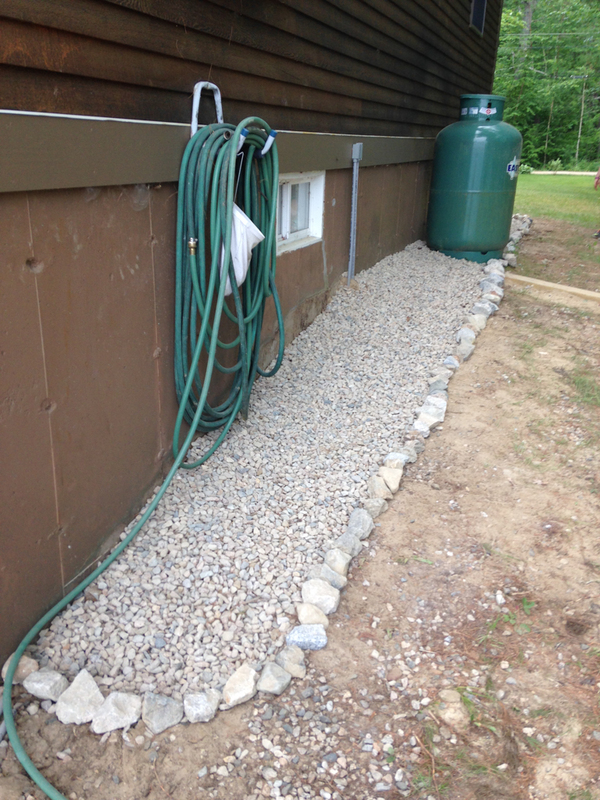 Extend the life of the dripline trench by lining the sides with non-woven geotextile fabric and filling to within 3” of the ground level with stone. 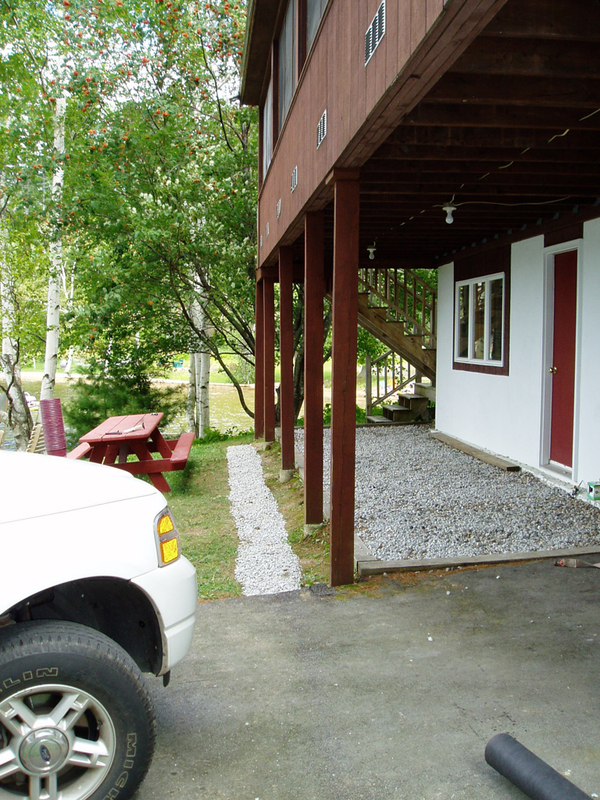 Fold a flap of non-woven geotextile fabric over the top of the trench and top off with additional stone. Note: Dripline trenches work best in sand and gravel soils that can quickly disperse a large volume of water. They should not be used on structures with improperly sealed foundations, as flooding may result. 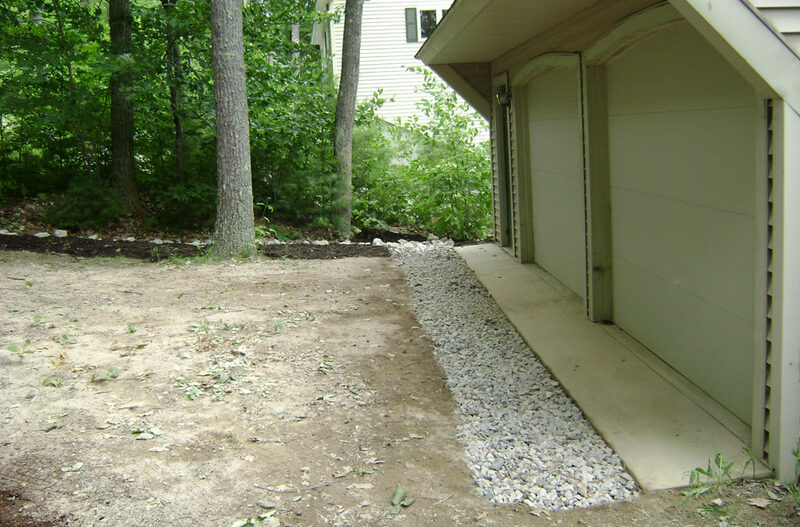 Maintenance: To maintain these structures, periodically remove accumulated debris and weeds from the surface. Trenches lined with non-woven geotextile fabric will require less frequent maintenance, however, they will still clog over time and the stone will need to be removed and washed to clean out the accumulated sediment and debris. The Conservation Practices for Homeowners Factsheet Series are also available at: Maine DEP or the Portland Water District. You can also find fact sheets at SOAK up the Rain NH.